Battlegroup Torch is the latest supplement to the Battlegroup World War II rules, written by Warwick Kinrade and published by Iron Fist Publishing and the Plastic Soldier Company. This book is hardcover with 230 full colour pages, and is of similar format to previous books. Torch is a direct sequel to Battlegroup Tobruk, and covers the second half of the desert war, starting with the Battle of Gazala and finishing with the final defeat of the Axis forces following the fall of Tunis. Following the introduction, the next 50 pages of the book provides an overview of 1942 and 1943. Interspersed with black-and-white period photos is a description of all the major operations and battles which took place across Egypt, Libya and Tunisa. Next are several pages of special rules, covering the unique issues of desert warfare such as issues of wear and tear, dust, and the distinctive mobile warfare in the desert. This changes in Tunisia, where the landscape is very different. The Army lists for the British and German armies include alterations for the fighting in Tunisia. Each army list includes a description of the order of battle, followed by some comments on the Tanks, Self Propelled Artillery, Armoured Cars, Armoured Personnel Carriers, Soft Skinned Vehicles, Guns and Artillery and Aircraft that comprise each force. There are then some notes on how terrain in Tunisia differs from the rest of the conflict in the desert – including some special rules and a terrain generator – as well as a new scenario which describes a Ridgeline Assault. The final pages of the rules give stats for vehicles of all armies, and there are some removable pages of stat cards and tokens. 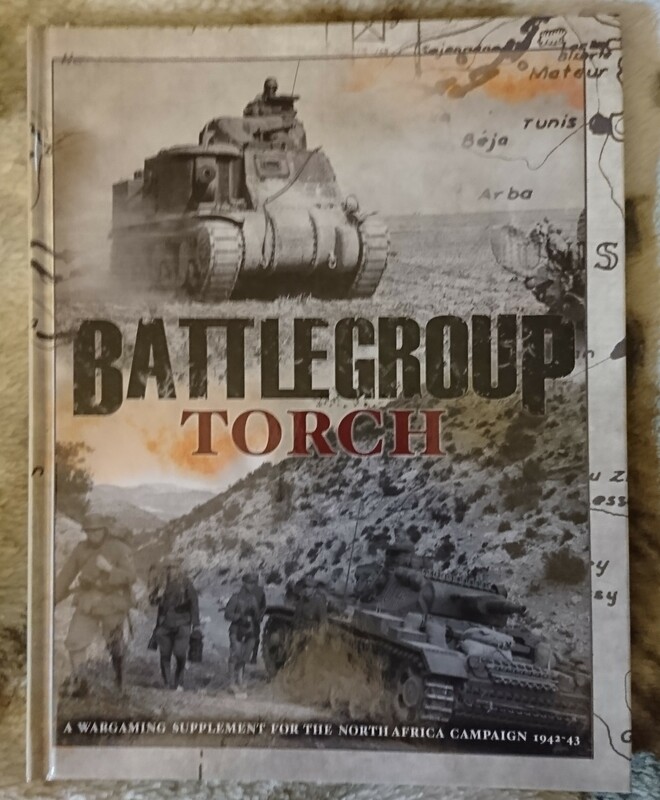 As with previous publications, Battlegroup Torch is a well written and beautifully produced supplement. The historical background contained within book makes it a good source of information for the conflict – both the battles and the forces and equipment involved. However, given that the majority of the book contains technical information for the Battlegroup rules, it’s use as a sourcebook for any other rules is somewhat limited. It is also worth noting that although this book covers both 1942 and 1943, the terrain generation details from Battlegroup Tobruk for the desert are not repeated here, so you will need the earlier volume to get all the rules that you require in that respect. This is another great addition to the Battlegroup stable of supplements. For gamers wishing to play the WWII Desert War, I would suggest that both Tobruk and Torch are must-buy supplements, as they complement each other. At £25 each, they represent something of an investment, but each book contains a wealth of information which represents a great deal of work and as such represent good value for money. Warwick Kinrade continues to impress with the quality of the material he is producing for this game.